BioLite's line of twig-burning, gadget-powering stoves has already cemented the brand as every wilderness geek's best friend. But now, the brilliant minds behind the CampStove are giving you off-grid power and potable water, both indoors and out. Say hello to the KettleCharge. Whereas BioLite's previous efforts have been more or less relegated for use in the great outdoors, the KettleCharge comes with the added benefit of being equally handy inside. Because as anyone who's been through a nasty hurricane—or any weather-related power outage—can attest, without access to potable water and power, you're pretty much screwed. And conveniently, the KettleCharge offers both. The only thing you need to supply (in addition to up to 750 ml of water) is a controlled source of heat—a backpacking stove, a hot plate, even an at-home gas range will do. Then, as your water begins to boil, lights along the KettleCharge's handle will keep you aware of how hot the bottom plate starts to get. Once temperatures hit dangerous territory (read: hot enough to start frying the electronics inside), a thoroughly maddening beep will sound until you take the kettle somewhere to cool down. Just like the CampStove and BaseCamp before it, the KettleCharge uses a thermoelectric generator to provide power to pretty much whatever you decide to plug into the kettle's on-board USB port. But this newest iteration puts out 10 W of power—double what you'd get from plugging into the BaseCamp alone. In other words, this thing can even charge a tablet. And while charging cords and burning hot surfaces might seem like a disaster waiting to happen (and generally would be), BioLite's accounted for that with a custom, non-meltable USB extender. 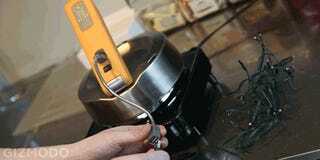 Meaning you can boil water and charge at the same time without worrying about boiling your gadget, too. Even if you choose not to power-up until later, the KettleCharge also offers onboard storage, ultimately allowing you about 15 minutes of charge time. Which, sure, isn't a whole lot, but at least in emergency situations, it's more than enough to make those few crucial phone calls.